On Ash Wednesday, I have felt nostalgic. Thinking back on past "mountain-top" experiences in my faith journey when I felt especially close to God. One of my most meaningful came in 1989, when as a member of the Tenn. Tech. Chorale we visited the Melk Abbey between Salzburg and Vienna, Austria (see above). 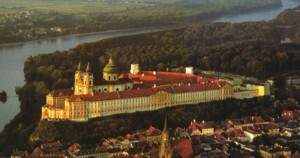 The Abbey has a rich history including being Napoleon's headquarters for a time in battling Austria, a benedictine monastery for almost 1000 years, inspiration for the novel (and movie) The Name of the Rose, and source of early thinking from the Reformation including some Humanist influences. Our visit was an amazing day providing me with a great sense of history and connection to the past. The highlight was definitely singing Super Flumina Babilonis by Palestrina in the chapel of St. Paul and Peter in the Melk Abbey. It was an awesome experience including tears from the entire bass section and our fellow bass and conducter Dr. Bob (Wright). I will attempt to locate some additional images to share.